Every look you want, for a price you can afford. Finding a chic coffee table can be a tough task—after all, there’s only so much Ikea one can buy. Don’t get us wrong: The Scandi line is one of our favorites for everything from inventive small space finds to colorful summer accessories, but mixing and matching is one of the greatest joys of home decor. Well, that and seeing it all come together when you finally find the perfect combo of budget-friendly, yet stylish options. 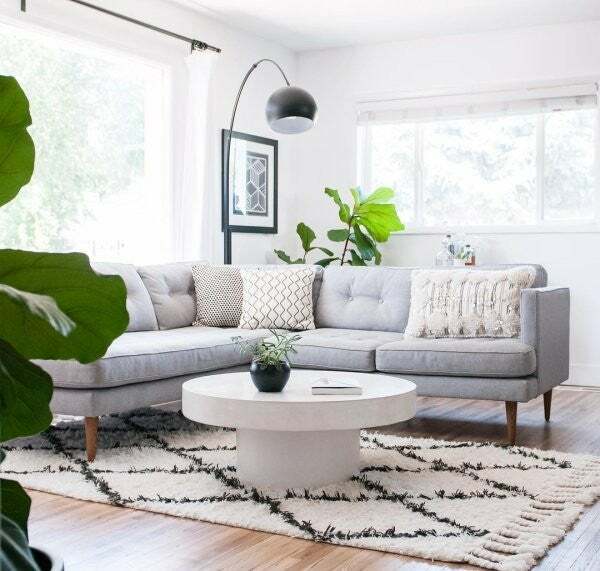 We looked through our favorite mid-range furniture brands (and trust us, there are so many) to find the coffee tables that make a huge statement in any living space. We chose options priced from $350 to $800, and whether you’re looking for metal accents and gold trims or hardwood tops and glass legs, there’s something for everyone—no matter your design style or budget. Made by craftsmen in Italy, each table features a unique variation on natural tree ring patterns. The stucco finish gives each hardwood table a polished, chic look that works well on light-filled, natural spaces—think an all white, bohemian aesthetic. For a truly minimalist look, this acrylic, clear coffee table boasts a sloping, curved edge and a glossy finish. It’s also super lightweight, and can be moved easily, thus making it ideal if you like to change things up a lot. All hail Queen B—the one that inspired this honeycomb-shaped table, that is. The geometric bottom allows storage thanks to the removable top, and the table comes in a variety of colors—grey, walnut, and white—so that it can work equally well with a multitude of styles. Memphis is coming back in a big way, and we can’t get over this maximalist look. The blue lacquer and multicolored tiles add a pop of color to an otherwise dull space, and the unique, sloping shape makes this a major collector’s item. The 1980s are looking pretty good right about now. Think Ikea’s minimalist simplicity, but elevated: Designed by Finland-based designer Stefan Holm, this simple option comes in three different colors and a solid oak finish. But the best part? You don’t even need tools to assemble this table, so if you’re living with roommates, consider this crowd-pleasing, inoffensive look. We can picture this sleek gold and marble number with a jewel-toned couch, light leather armchairs, or even a smart suede sectional. Seriously: It’ll go with literally anything. Top with flowers or your favorite books for contrast, or leave blank to let the marble top shine through. We’re obsessed with the sleek Carrara marble on this otherwise simple steel-frame box. It comes in two different sizes, therefore making it a rare find for small spaces, but it’s also thin enough to work as a side table, too. A unique mix of marble, granite, and stone come together to form an industrial-chic table inspired by sleek Scandi style. Natural variations in tone and texture still add interest, but this is one style where the shape steals the show. It’s great for a first apartment, because you can really change your look every month with this option. Like to live more on the darker side? Black marble just might be your material of choice. The gold legs prevent the coffee table from looking too dark, and the U-shaped legs add an unfinished feel to the item that gives it a more relaxed aesthetic. Complementary oak and marble shelves allow this table to appeal to mid-century modern and contemporary lovers alike. The lower level can also be used as a smart storage space, while the gold legs up the glam factor. There’s no better combo than sleek marble and walnut wood, but what if we told you this option also allows for built-in shelving and a pop-up top to reveal hidden storage space? The pop-up top also works as a desk for when you can’t be bothered to move to your home office (hey, we’ve all been there). We can all agree that natural wood is gorgeous, but cleaning it can be a real chore. And seriously, who has the time, anyway? This heathered grey option is kiln-dried, which ensures the material will never warp, crack, or split, while the lacquer finish is oil-based—aka, no stains! It also features a hidden compartment for extra storage if you want to hide all your embarrassing reads before your friends come over. Marble is always a safe bet when you’re looking to let your coffee table be a statement-making addition to your home decor. We love the geometric design in the elevated gold steel base: The open and airy shape balances out the sturdy marble top.